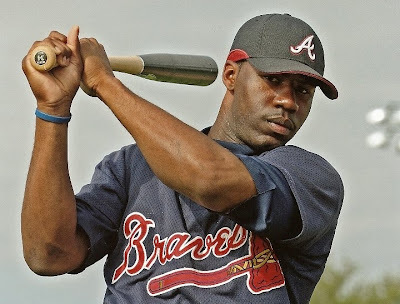 Jason Heyward is the top prospect in the Atlanta Braves farm system. For that matter, the twenty year old is the top prospect in all of Major League Baseball. Baseball America named the 6'4", 245 pound slugger the 2009 minor league player of the year. He will arrive at the Braves spring training facilities shortly with a legitimate chance to earn the starting right field job for the big league club. Making the opening day starting roster is the only way Heyward starts out the year in Atlanta, because the club does not want their still-developing phenom to be sitting on the bench anywhere. It's an all or nothing proposition with regards to the big show. Having had only three at bats late in the season at Gwinnett, Heyward would be pretty much skipping Triple A ball if he starts in Atlanta. Last year he hit .323 in A and AA ball, and he has only 173 at bats above the Class A level. None of this seems to phase the young Heyward in the least. His attitude is to have fun and let everything else take care of itself. I think things will take care of themselves very well in Jason Heyward's baseball future. After all, he's what they call a "can't miss" kind of guy.